I first learned of Errol Flynn’s life and work when by chance I happened upon his autobiography, My Wicked Wicked Ways, in audio format at the Huntington Beach Library some two decades ago. It was an exhilarating find, as it is one of the funniest and most insightful books I have ever listened to in my life. In fact, it was so good that I got a copy of the book and read it cover to cover again, and I was even more mesmerized by Errol Flynn’s hilarious stories and pithy insights the second time around. I became an instant fan and sought out as much information as I could about this charming rogue who had starred in some of the most popular movies in Hollywood from the 1930s and 1940s, including his breakout role in Captain Blood. Besides being regarded as one of the handsomest men to ever adorn the silver screen, Flynn was also a scandalous character in real life, skirting the very edges of what was legally permissible during his day. Yet, what I found most endearing about Flynn was his philosophy about life and how open he was about his own contradictory nature. Over time I read everything I could by and about Errol Flynn, including his underrated novel Beam Ends, published in 1937. What makes Errol Flynn so continually fascinating is that he lived a life that was so adventurous and seemingly impossible it borders on the surreal, particularly given the cultural norms of that time period. Refreshingly, Flynn makes no apologies for his lifestyle and even revels in his iconoclastic ways. It is difficult, if not misleading, to summarize Errol Flynn’s philosophy in just two sentences. Yet, I do think Flynn captures the essence of his thinking when he opines, “I know that truth is sometimes an octagon and that I am one. 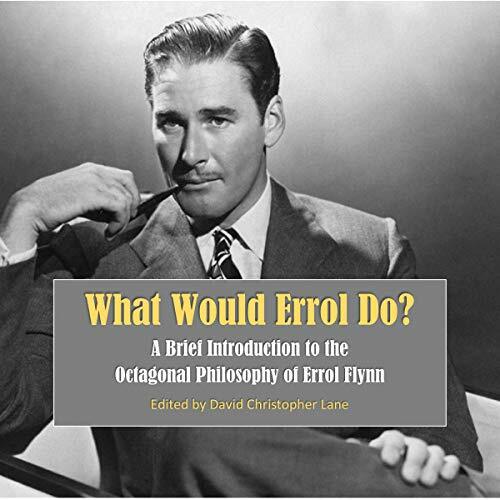 Contradiction is a cardinal element of life and of itself may be no contradiction.” The following book, which is the second edition, contains a series of pregnant quotes from Errol Flynn (with occasional commentary by myself) throughout his career.